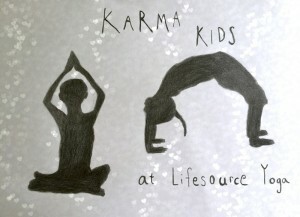 Lifesource Yoga Karma Kids is back! Four consecutive Saturday mornings for boys & girls 6-11 years old. We will focus on fostering peace, kindness, respect, and understanding through yoga, arts & crafts, song & dance. so this may be a great time for mom or dad to practice too! Call the studio for additional information or to reserve your spot. Or, visit Mind Body Online, click on the Camps tab and navigate to June 6, 2015 to register.